Norman Stingley was not attempting to produce a new fad when he began conducting experiments with highly resilient rubber. The new compound manufactured by Stingley became unbelievably bouncy when compressed under extreme pressure. Stingley was unsure what to do with his new product. He could not figure out a use for this new rubber. He offered the product to his employer, Bettis Rubber Company but they were not interested in the material. The material was not very durable and they feared it would never be marketable. Eventually, Stingley showed his rubber to Wham-O Manufacturing Company, the very successful makers of the Hula Hoop and Frisbee. The company agreed to work with Stingley on the compound. For nearly two years, they worked to design a more durable rubber. They did finally succeed and produced a rubber that stood up to regular wear known as Zectron. The SuperBall was born. On August 25, 1965, Norman Stingley applied for a patent for his new toy. He received US Patent 3,241,834 on March 22, 1966 for a Highly Resilient Polybutadiene Ball. The SuperBall was an instant hit. Wham-O’s marketing success continued and the SuperBall quickly became a fad. The ball was the most popular toy in the summer of 1965. 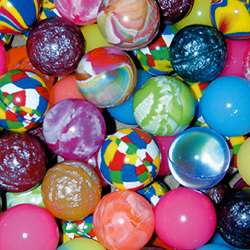 By December of 1965, just six months after its release, over six million SuperBalls had been sold. Wham-O contracted the toy out to four additional factories in order to meet demands. At its peak, 170,000 SuperBalls were being manufactured each day. 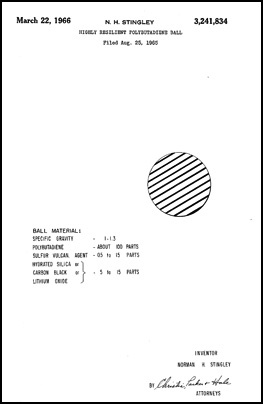 The SuperBall was capable of bouncing back to 92 percent of the height from which it was originally dropped. Initially, the toy was the color and shape of a plum. This size SuperBall sold for ninety-eight cents. A year after its release, smaller and more colorful versions of the ball could be bought in vending machines for about ten cents. Wham-O often did promotional stunts to promote its products. The most infamous SuperBall stunt destroyed a parked car. A SuperBall about the size of a bowling ball was dropped from the 23rd floor of an Australian hotel. On its second bounce the ball landed on the roof of a parked convertible and damaged the car. The fad died out by the end of 1967. Over the years, Wham-O has rereleased the toy but none has had the same bouncing power as the original and the ball has never seen the same level of success as in 1965. ← Invention Geek – Eminent Domain?